Marwan ibn Muhammad ibn Marwan, also called Marwan II (691 – 6 August 750; Arabic: مروان بن محمد بن مروان بن الحكم / ALA-LC: Marwān bin Muḥammad bin Marwān bin al-Ḥakam), was an Umayyad caliph who ruled from 744 until 750 when he was killed. Much of his reign was dominated by the Third Fitna, and he was the last Umayyad ruler to rule the united Caliphate before the Abbasid Revolution toppled the Umayyad dynasty. Marwan ibn Muhammad was a member of the Marwanid household of the Umayyad Caliphate. In A.H. 114 (732–733) Caliph Hisham appointed Marwan governor of Armenia and Azerbaijan. In A.H. 117 (735–736) Marwan invaded Georgia, devastated it and then took three fortresses of the Alans and made peace with Tumanshah. In A.H. 121 he launched further raids and obtained tribute. In A.H. 126 on hearing news of the plotting to overthrow al-Walid II Marwan wrote to his relatives from Armenia strongly discouraging such an act. He urged them to harmoniously preserve the stability and well being of the Umayyad house. When Yazid III persisted in overthrowing al-Walid II, Marwan at first opposed him, then rendered allegiance to him. On Yazid's early death, Marwan renewed his ambitions, ignored Yazid's named successor Ibrahim and became caliph. Ibrahim initially hid, then requested Marwan give him assurances of personal safety. This Marwan granted and Ibrahim even accompanied the new caliph to Hisham's residence of Rusafah. Marwan named his two sons Ubaydallah and Abdallah heirs. He appointed governors and proceeded to assert his authority by force. However, anti-Umayyad feeling was very prevalent, especially in Iran and Iraq. The Abbasids had gained much support. As such, Marwan's reign as caliph was almost entirely devoted to trying to keep the Umayyad empire together. Marwan took Emesa (Homs) after a bitter ten-month siege. Al-Dahhak ibn Qays al-Shaybani led a Kharijite rebellion. He defeated the Syrian forces and took Kufa. Sulayman ibn Hisham turned against Marwan, but suffered a severe defeat. The Kharijites advanced on Mosul and were defeated. Sulayman joined them. Al-Dahhak's successor al-Khaybari was initially successful in pushing back Marwan's centre and even took the caliph's camp and sat on his carpet. However, he and those with him fell in fighting in the camp. Shayban succeeded him. Marwan pursued him and Sulayman to Mosul and besieged them there for six months. Then reinforced the caliph drove them out. Shayban fled to Bahrayn where he was killed; Sulayman sailed to India. In Khurasan there was internal discord with the Umayyad governor Nasr ibn Sayyar facing opposition from al-Harith and al-Kirmani. They also fought each other. In addition Abbasid envoys arrived. There had long been religious fervour and a kind of messianic expectation of Abbasid ascendency. During Ramadan 747 (May 16–June 14), they unfurled the standards of their revolt. Nasr sent his retainer Yazid against them. Yazid, however, was bested, taken and held captive. He was impressed by the Abbasids and when released told Nasr he wanted to join them, but his obligations to Nasr brought him back. Fighting continued throughout Khurasan with the Abbasids gaining increasing ascendency. Finally, Nasr fell sick and died at Rayy on November 9, 748 at the age of eighty five. The Abbasids achieved success in the Hijaz. Marwan suffered a decisive defeat by Abu al-'Abbas al-Saffah on the banks of the Great Zab called Battle of the Zab. At this battle alone, over 300 members of the Umayyad family died. Marwan fled, leaving Damascus, Jordan and Palestine and reaching Egypt, where he was caught and killed on August 6, 750. His heirs Ubaydallah and Abdallah escaped to modern Eritrea. Ubaydallah died in fighting there. Marwan's death signalled the end of Umayyad fortunes in the East, and was followed by the mass-killing of Umayyads by the Abbasids. Almost the entire Umayyad dynasty was killed, except for the talented prince Abd ar-Rahman who escaped to Spain and founded an Umayyad dynasty there. Kennedy, Hugh N. (2004). 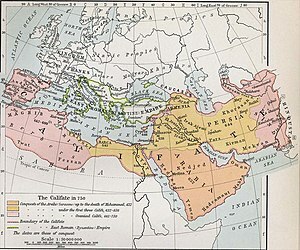 The Prophet and the Age of the Caliphates: The Islamic Near East from the 6th to the 11th Century (Second ed.). Harlow: Pearson Education Limited. ISBN 0-582-40525-4.